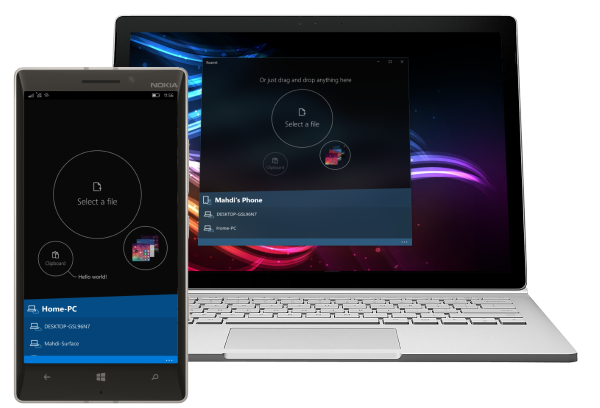 Have a seamless experience across your Windows and Android devices! Continue reading web pages on your devices, and even on your Xbox in your living room. Share pictures and files between your devices via local network. Roamit is integrated into the share menu, so you can send any data from your apps to your other devices. With universal clipboard, every text you copy will be automatically mirrored to your phone. You won't even need to open the app, your clipboard content will be right there under your fingertips. This feature is optional. if you disable it, you still can send your clipboard content by simply tapping a button in the app. Roamit is already integrated in Google Chrome (on Android) and Microsoft Edge (on Windows 10) via the built-in Share menu. Also, you can install Roamit extension for Chrome and Firefox on your Windows 10 PC to enjoy a seamless experience in your favorite browser. Windows 10 and the Windows logo are trademarks of Microsoft Corporation.